Follow these steps when negotiating your IT services contract to reduce the impact of disagreements — and potential litigation — on your business. Disputes between outsourcing customers and their providers are like a clash between buffalo, says Daniel Masur, partner in charge of the Washington, D.C. office of law firm Mayer Brown. The parties bang heads, lock horns and make little progress other than giving each other a massive headache. Disagreements during an outsourcing relationship are nearly impossible to avoid. Indeed, there are a number of inevitable sources of friction, including contractual ambiguity; deal points that require further negotiation; missed service levels; and changes in objectives, technology, or market conditions. Even short of litigation, festering arguments can lead to blown deadlines, unmet business objectives, and missed financial goals. However, there are several steps outsourcing buyers can take during the contract negotiation and drafting process that will make dispute resolution simpler, quicker, and less costly down the line. Negotiate a clear, comprehensive outsourcing contract. It may sound self-evident, but many outsourcing agreement built atop ambiguity and promises. And the current rush to complete a deal isn’t helping, Masur argues. “To the extent you can, it’s really important to build in the time necessary to think through theses issues,” says Masur. “’Trust me’ is great, but writing down what it is I trust you to provide is even better.” Masur advises creating a clear description of service milestones, dates, deliverables, and performance standards. In addition, he suggests the inclusion of a dragnet or sweeps clause, which compels the supplier to perform services and functions performed by in-house staff during the one year prior to the contract even if not described in the statement of work. Define a customized dispute resolution process. “Lots of deals that are done on cookie-cutter templates that consultants, procurement organizations, or lawyers may have,” says Masur. Instead, outsourcing customers should consider what would work best in their specific cases, from dictating when disputes will be escalated to spelling out how collaboration will be facilitated. Such clarification is especially important in a multi-sourced environment since issues will have to be resolved across several IT service providers, Masur says. Create leverage. A litigation-proof outsourcing agreement gives customers options when the things take a bad turn. Among those are the right to insource or use other providers on existing and new services, the right to withhold disputed charges, the approval or removal of key personnel, and the right to terminate for convenience or cause. One of the simplest yet most effective clauses is one that requires the supplier to use the customer as a reference. Put it all in writing. An outsourcing relationship is fluid; situations change. Consent, waiver, concession—whatever verbal agreement arises, put it down on paper and do it in real time. “Contemporaneous records are the best record of what was agreed to,” says Masur. In addition, designate one place where all such documentation is stored. In the typical outsourcing relationship, such information is scattered among hundreds of employees and thousands of emails, making dispute resolution more costly and complicated than necessary. Collect — and redeem — IOUs. An outsourcing deal isn’t done when the ink is dry; negotiations are ongoing. Concessions are bound to occur, but such cooperation needs to be a two-way street. 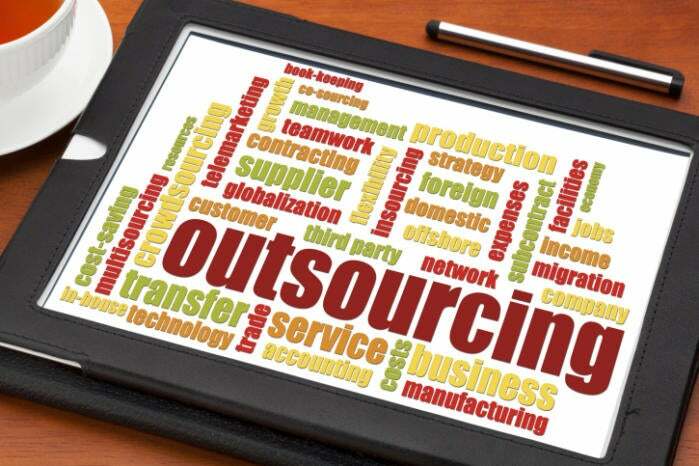 “Think of the outsourcing relationship as ongoing barter,” Masur recommends. “There are things the customer needs or wants that aren’t built into the contract, and things the supplier wants or needs.” Masur suggests creating nonbinding IOUs when granting concessions. When you have a need, cash one in. Maintain clear delegation of authority. Consider putting one person in charge of any changes to the contract while giving them the ability to delegate that responsibility if necessary. Employees can, deliberately or not, agree to changes in the relationship without a clear understanding of the contract. In addition, by creating an authority figure, neither the outsourcing customer nor provider can “shop” for the responses they want, says Masur. Include an accelerated dispute resolution clause. When an outsourcing customer decides to acquire a company, for example, it’s no time for a knock-down-drag-out fight over whether the outsourcing provider is obligated to participate in integration and support or how much that will cost the customer. It’s important to contractually require the provider to proceed with new projects, services, and other requests as requested, says Masur. Define an accelerated, informal process for moving ahead in such situations. The contract should stipulate that if customer and provider do not agree on a new scope of work and cost within a specified period of time, the customer begins paying a defined percentage of the disputed amount and, once resolved, pays up based on the outcome. There’s a danger that the customer may pay more than it wants, but it’s the best way to share risk, says Masur. “It’s not fair to require the provider to work for an indefinite period of time without resolving the issues and having clarity,” says Masur. An accelerated dispute resolution clause reduces impact on the customer while minimizing the impact on the provider and the relationship.